Rabbit–the even newer white meat–is showing up more often on restaurant menus and kitchen tables. They’re cute–and highly digestible. Rich in Omega 3 fatty acids, high in protein, low in calories, rabbit is speedily becoming the even-newer white meat. So say star chefs, culinary schools, meat producers and, increasingly, ordinary home-cooks, who are consuming more rabbit than at any time since WWII. Ariane Daguin, founder and CEO of specialty-meat supplier D’Artagnan, tells ABC News her rabbit sales are double what they were four years ago. He calls it an efficient meat: Rabbits, using the same amount of food and water a cow needs to produce a pound of meat, he says, can produce six pounds. Compared to beef, pork, lamb, turkey, veal and chicken, rabbit has the highest percentage of protein, the lowest percentage of fat and has the fewest calories per pound, according to the U.S. Department of Agriculture. It used to be that eating rabbit was almost as common in the U.S. as it still is today in Europe. During WWII, most U.S. beef was dedicated to feeding troops overseas. Folks on the homefront took to raising rabbits as substitute protein. After the war, beef resumed its primacy and rabbit consumption declined. 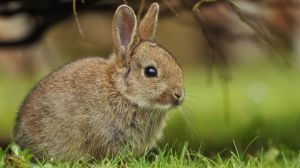 Recent years have seen it come hopping back: In 2012, the last year for which the USDA has data, more than 5,000 farms sold $15 million worth of live rabbits (about 853,000 animals). Out in Marin County, north of San Francisco, Mark Pasternak and his wife own and run Devil’s Gulch Ranch. Almost 20 years ago, he tells ABC News, the couple and their daughters bought a few rabbits–two females and a male–as part of a 4H project. Today Devil’s Gulch has 2,000 rabbits, including 350 breeding females. He sells 300 rabbits a week, mostly to chefs but also to the general public, through farmer’s markets and directly from his ranch. Then one night, they had a chef friend from San Francisco over for dinner and served him rabbit. He liked what he tasted. After that, says Pasternak, the calls started coming in–first from Chez Panisse, then later from the French Laundry, La Folie, State Bird Provisions. His ever-lengthening list of restaurant customers includes Thai eatery Kin Khao, where chef Michael Gaines makes a green curry with rabbit loin and saddle. Right now, he says, the meat market is seeing what he calls “the great rabbit shortage of 2014″: Demand has outstripped supply. Could rabbits take off with “urban farmers,” the same was as urban chickens have? They already have. Pasternak says he has offered classes for homeowners who want to raise a few rabbits in their back yards. Declares a recent USDA report, “Rabbits have become the urban chickens of the 2010s.” But with one difference important to homeowners who prize sleep: Rabbits, notes Pasternak, don’t crow at 4 in the morning.